Hi everyone! I am so excited to post my first guest review! I hope you all enjoy it! Also a big thank you to my guest reviewer Mark I really appreciate it! 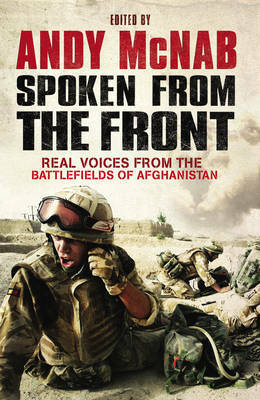 Goodreads: Spoken from the Front is the story of the Afghan Campaign, told for the first time in the words of the servicemen and women who have been fighting there. With unprecedented access to soldiers of all ranks, as well as pilots, reservists, engineers, medics, Royal Military police, mechanics, cooks and other military personnel, Andy McNab has assembled a portrait of modern conflict like never before. This is the full experience of our troops on the ground and in the air. The horrors, cruelties, drudgery, excitement and banter of these soldiers' lives combine to form a chronological narrative of all the major events in Helmand during the British Army's time there. From their action-packed, dramatic, moving and often humorous testimonies in interviews, diaries, letters and emails written to family, friends and loved ones, emerges a 360-degree picture of guerrilla warfare up close and extremely personal. It is as close to the real thing as you can get. This book gives great insight into the lives of our military personnel whilst serving on operational duty within the Armed Forces in Afghanistan. It shows the feelings and emotions that people have whilst working in a warzone through both the good times and bad. You can’t beat a bit of Army banter and this book showed some of that. I felt it was quite easy to picture what was going on whilst reading as I have served within the British Army myself and gone through a lot of those same emotions and feelings. On a more personal note, I actually know some of the people who have provided the accounts for the book. Andy McNab took accounts from a whole host of people who had different job roles within the British Army, Territorial Army (TA) and Ministry of Defence. There are a few accounts within the book which as I was reading I thought why are they even in here. These accounts weren’t from any of the regular serving personnel. They were quite annoying to read with comments showing that they weren’t used to the military way of life at all. Luckily though these were limited to just a handful. one can only guess but yes it was a fantastic review..